Small, metallic green Sweat Bees (Family Halictidae) are now out busily visiting those few wildflowers that are blooming despite our severe drought. These common bees are important pollinators of many desert plants. Sweat Bees get their common name because of their unusual attraction to sweat, probably for its salt content. They will land on you and then drink your sweat. If disturbed while drinking, these tiny bees will sting, but their stings are not as painful as those of a Honeybee (Apis mellifera). As I learned from personal experience, attempting to swat them or brush them off with your hand will likely result in a sting. Flicking them off with your finger or blowing them away with a puff of air work much better. 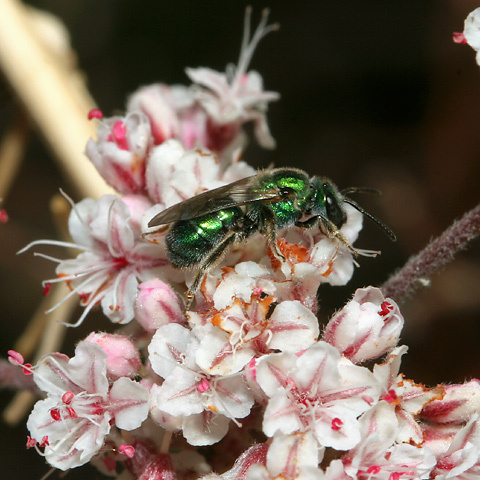 Sweat Bees come in a variety of colors, but those that land on me here in Tucson are a bright metallic green. It's not yet hot enough for the Sweat Bees to be bothering me, and for now they seem only to be interested in the wildflowers. I don't know what species this Sweat Bee is. It can be a real challenge to identify bees here because the area around Tucson, Arizona has probably more kinds of bees than anywhere else in the world (with the possible exception of some desert areas in Israel). There are approximately 1,000 to 1,200 species of bee within 100 miles of Tucson.